SOME ENVIROS UNHAPPY WITH GREEN BILL: Not all environmentalists are cheering the Maryland General Assembly’s approval Monday of incentives that double down on utility customers’ investment in renewable energy, Scott Dance of the Sun reports. They all agree reaching a goal of 50% green energy by 2030 would help reduce greenhouse gases and combat climate change. But some say a bill approved in the final hour of the legislature’s annual session will only magnify a wrinkle in state policy that rewards carbon-emitting trash incinerators and paper mills with millions of dollars in green energy subsidies that are funded through energy bills. PROGRESSIVE WAVE: Erin Cox of the Post reports that Maryland voters elected a wave of younger, more liberal lawmakers to the state legislature last fall for the second time in five years, building a force theoretically poised to reshape the politics of the General Assembly. So far, however, the Democratic Party’s liberal wing has had limited success. Bryan Sears of the Daily Record writes that more the progressive legislature, one where nearly one-third of the members are new, passed bills that set up future debates over education funding, the environment and marijuana policy. Democrats were able to perform lightning-fast overrides of vetoes issued by Gov. Larry Hogan. Even their failures on bills such as the banning of some herbicides or a bill to permit medically assisted suicide seem to establish a marker for coming years. A POIGNANT FIRST YEAR: Diane Rey of MarylandReporter writes about freshman Del. Alice Cain’s reflections of her first year in office. She shared a district — 30A — with Speaker Michael Busch, whom she considered a friend and mentor. WHAT PASSED, WHAT DIDN’T: Lawmakers began their 90-day session with questions about Senate President Mike Miller’s health and ended it mourning long-serving House Speaker Michael Busch. In between, they passed hundreds of bills, addressing issues from oyster sanctuaries to tanning beds to medical marijuana edibles. The measures still must be sent to Gov. Larry Hogan (R), who can veto them, sign them into law or allow them to become law without his signature. Rachel Chason of the Post writes about what passed the Democratic-led General Assembly, and what didn’t. The final, marathon day of the 90-day legislative session brought some last-minute successes and losses in the General Assembly. Pamela Wood and Luke Broadwater write about who and what came out on top — and didn’t — this year in Annapolis. Here’s a summary of noted bills, some that passed, some that failed during the 90-day session, courtesy of the Daily Record and wire reports. 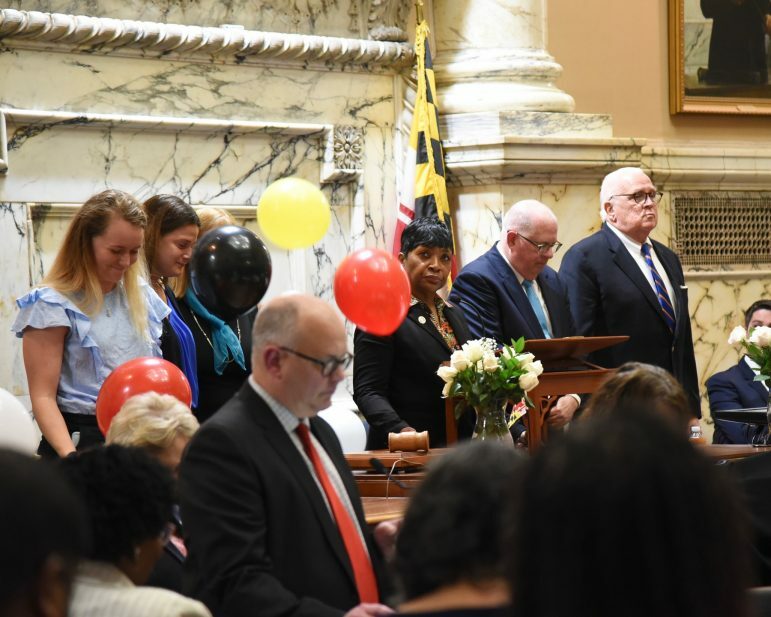 ARUNDEL BILLS: WHAT PASSED, WHAT DIDN’T: The Annapolis Capital staff offers a look at legislation affecting Anne Arundel County and how it fared in the 2019 General Assembly including bond projects, hate crime legislation and expanding liquor licenses at Laurel Park. Public visitation will be from 1 to 7 p.m. Monday and from 8 to 10 a.m. Tuesday, his family announced in a statement. The Anne Arundel Democrat was Maryland’s longest-serving speaker. His funeral will be Tuesday at 11 a.m. at St. John Neumann Church in Annapolis, Rachel Chason of the Post reports. WINNERS & LOSERS: The Daily Record compiles a list of its 2019 session winners and losers includes props to Sen. Jill Carter, whose legislation led to disclosure of self-dealing by Mayor Catherine Pugh and other members of the UMMS board. Coming out on the losing side: Comptroller Peter Franchot, whose oversight authority over tobacco, alcohol and fuel was gutted. The Daily Record also rounds up a series of notable quotes from the 2019 session. 2020 BILL WOULD CHANGE RUNNING MATE PICK PROCESS: A long-standing ritual of Maryland politics — the selection of gubernatorial running mates prior to the party primaries — would vanish if a measure backed by two powerful lawmakers becomes law next year, Bruce DePuyt of Maryland Matters reports. Under a proposal drafted by Sen. Paul G. Pinksy (D-Prince George’s) and Del. Kumar P. Barve (D-Montgomery), candidates for governor would run solo. The candidates who win the primary would then have 21 days to select a running mate. BA CO SCHOOL CONSTRUCTION DELAYED: After a $2 billion school construction bill stalled in the Maryland Senate at the end of the 2019 legislative session, Baltimore County Executive Johnny Olszewski Jr. said new school buildings on the county’s wish list will be delayed at least a year, Libby Solomon reports in the Towson Times. “There is no plan B,” Olszewski said Tuesday. PUGH RECOVERING FROM SEVERE PNEUMONIA: Close advisers to Baltimore Mayor Catherine Pugh said Tuesday that she is still recovering from a serious case of pneumonia that has sapped her strength and forced her to convalesce at home, under doctors’ supervision, since late last month, writes Kevin Rector for the Sun. She took a leave of absence — which she attributed to her illness — on April 1, after it was further revealed that she had also collected hundreds of thousands of dollars for her books from various entities doing business with the city, including Kaiser Permanente. UMMS DELAYS BONUSES: The acting chief of the University of Maryland Medical System is halting the award of bonuses for senior executives that are typically approved by the board of directors until an independent review examines whether the hospital network’s embattled governing body properly followed its policies, Doug Donovan and Luke Broadwater report for the Sun. MARYLAND PUBLIC HOUSING FAILING: The AP is reporting that almost a third of public housing inspections in Maryland have resulted in failing health and safety scores. An analysis of federal data by the Associated Press shows that’s the worst performance in the country. Old, rundown complexes in Baltimore are the main culprit. Federal and city data show that 22 of 37 Baltimore sites failed their most recent inspections.